Keep your motor looking its best with CARPLAN products, the UK’s number one selling brand for complete car care products. Since the 1960s they’ve manufactured a leading range of valeting essentials including scented air fresheners, high-quality wax, body paint and more so you’ll be sure to find everything you need to clean and valet your car inside and out. 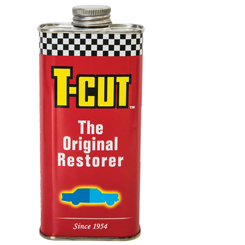 CARPLAN’s famous T-Cut range can be used to remove annoying scratches and help restore paintwork back to its original colour. Decades have gone into creating a product range proven to do the job! Their Wonder Wheels product range will also leave alloys gleaming. Easy to apply, the special formula helps remove thick grease and brake dust for outstanding results. Helping to keep your motor’s interior spotless, CARPLAN products include a range of cleaning essentials made to deep clean upholstery. Easy to use, the special formula will remove deep stains and marks from all materials. They also manufacture an extensive range of car air fresheners, so there’s a scent for everyone. When the cold weather hits make sure you’re prepared with Winter Car Care, this range includes specially formulated products that are tried and tested to deliver throughout winter. Have a question about our Carplan range? We‘ll be happy to help. Send us a message here.